Do they make vinyl blind stops? The last window to be replaced is a 48" x 54" picture window. The blind stops on this window are in pretty bad shape, so I want to pull them out and replace them. If the outside of the pocket where the stops are matches what I can see on the inside after I pull the interior trim, there is going to be a dado in which the 3/4" x 1/2" blind stop sits, leaving approximately 1/2" x 1/2" exposed. I can buy 3/4" x 1/2" wooden stops in any big box store, but not vinyl. Why not? Is there just not enough demand for them? I guess I can rip down some of the 3/4" x 1 1/2" to 3/4" x 1/2" to make my own stops, but I find it curious that they don't sell it outright. Does anybody know who, if anybody, sells vinyl stops? What would be the purpose of inserting a vinyl stop into a wood frame with wood brickmold, etc? ...It is not available because there is really just no reason for it. If you want to get rid of all the wood, then tear the whole frame out. If you just want to make the exterior as maintenance-free as possible, then replace any bad wood and cap it all with aluminum... I have to add, that in the thousands of windows that I have been a part of replacing over the years, I can't ever remember seeing rotted blind stops.... So again, my question--and my answer-- is : Why? I did this once years ago by ripping down some Never Rot cellular PVC from Lowes. Worked out pretty nice but the head of my 15-gauge cordless nailer didn't like the angle of the screen track of the particular manufacturer of the newly installed vinyl window, thus I got stuck going old school with my hammer. I didn't say the stops were rotted. I said that they were in bad shape. The current window has (had) an aluminum storm whose frame had been screwed into the exterior face of the stop with a ton or two of caulk added for extra measure. 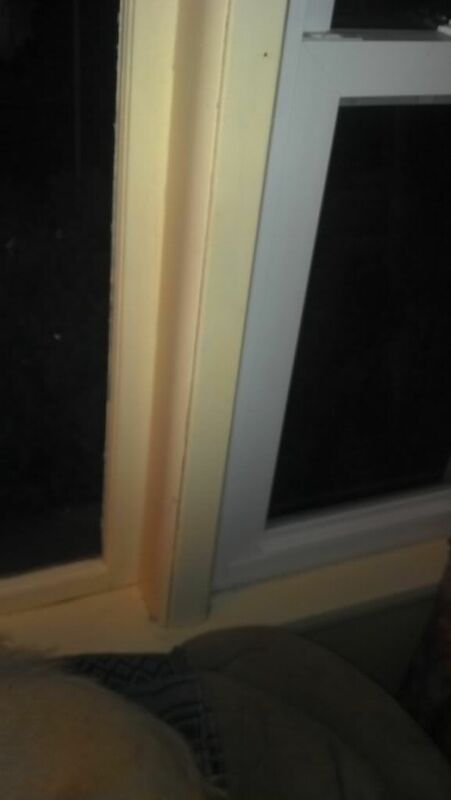 The wood on the outside of the storm had been wrapped in aluminum up to the storm window frame. Since I've removed the storm window frame the stops are now exposed. They have multiple screw holes from the storm window screws. It looks like the frame has been replaced over time since there are more screw holes in the stops than there were in the frame. Some parts of the stop are also broken since the frame was basically glued on by the caulk. That's what I meant by "bad shape". Yes, I could replace the old stops with wood and then have someone come and re-cap all the wood - it's not something that I can do. However, instead of doing that, I would rather replace them with vinyl and make it a complete DIY job that would never need maintenance. On all of the other windows I replaced in the house, the storm frames were simply screwed to the exterior stops - no caulk - so there was very little repair work needed for the stops. I filled the holes, sanded, primed and painted. I can repaint them if need be since they are all double hungs with easy access from the inside. For this picture window, as long as I have to replace the stops, I'd rather do it with vinyl so I'd never have to worry about painting. The aluminum covers the exterior wood, a bead of caulk seals the seam between the aluminum and the vinyl stop and then again between the stop and the VRW. Maintenance free. Painting wooden stops in the future would be a pain because of the limited exterior access to this window. Like I said, I can rip my own, which is probably what I'll do. Delaware Mike wrote: I did this once years ago by ripping down some Never Rot cellular PVC from Lowes. Worked out pretty nice but the head of my 15-gauge cordless nailer didn't like the angle of the screen track of the particular manufacturer of the newly installed vinyl window, thus I got stuck going old school with my hammer. It sounds like you replaced the stops after the windows were installed. Isn't that backwards? I have to remove the interior "stops" (actually the casing) since the VRW is much deeper than the existing single pane. Once it hits the exterior stops, the front face is going to be inside the room by a couple of inches, so I'm going to have to either rip the existing casing down or replace and paint. Hopefully I can just rip it down and avoid trying the match the paint. I also have to remove the stool and rip it down. As it turns out it is available. The pdf that can be downloaded via this link shows the 1/2" x 3/4" that I'm looking for as well as just about every other profile of stop one could want. Now I just have to see if it's carried locally. I see your motivation being that the existing brickmold is already capped. What you're describing is still uncommon, as 99% of installs would be the paint route that you mentioned, or if done by a pro, they would either re-wrap the entire thing (most commonly), or just put an L-bend on the blind stops... but again, being diy, what you are trying to accomplish makes sense now that you've explained it. What i do question is your comment "the front face is going to be inside the room by a couple of inches". Am I misunderstanding that, or is the inside edge of the window going to protrude past the wall surface? ... What is the jamb depth of the opening? Of the new window? HomeSealed wrote: What i do question is your comment "the front face is going to be inside the room by a couple of inches". Am I misunderstanding that, or is the inside edge of the window going to protrude past the wall surface? ... What is the jamb depth of the opening? Of the new window? What I meant was that the interior face of the VR Picture Window is going to be inside the room by a couple of inches more than the current interior face of the wooden picture window is now. I don't have the exact measurements with me, so everything I'm about to say is approximate. I'm also a DIY'er so if I don't use the perfect terms, please bear with me. Envision a single pane wood framed 48" x 54" picture window flanked by 2 double hung VRWs. The DH's are roughly 3.75" deep (interior face to exterior face) This is the same depth as the orginal wooden DH's I replaced last year. However, the wooden picture window is only 1.75" inches deep. Since the exterior faces of all 3 windows are on the same plane, the interior faces are not. Therefore the stool is "deeper" in front of the picture window than in front of the DH's. Note: There is a "upright member" between the DH's and the picture window that I have not shown. The stool obviously fits around these uprights, but it would be to difficult to include them in the picture. Now, the VR Picture Window is going to be the same 3.75" inches deep as the VRW DH's and once it is installed, the interior faces of the 3 windows will then be on the same plane. That means that I have to remove the stool first and rip down the section in front of the picture window so that it is the same depth as the sections in front of the DH's. I'll also have to rip/replace the interior trim-stops that are perpendicular to the interior face of the picture window since they are currently the same "depth" as the stool. I think I've got it... So previously, your stool board extend further into the opening as the Picture window sash was pushed to the blind stops? ... so now you just have to rip the stool to one consistent size across the opening? Forgive me if I'm still misunderstanding... That would be pretty unconventional as the picture window would normally be brought up to the interior stops so the wood work would be consistent, and all three openings would accept a 3 1/4" pocket replacement in the same way. HomeSealed wrote: ...So previously, your stool board extend further into the opening as the Picture window sash was pushed to the blind stops? ... so now you just have to rip the stool to one consistent size across the opening? Actually, we have always liked the fact that the picture window was "deeper in the pocket" than the double hungs. Keep in mind that I mentioned that there are vertical uprights separating the DH's from the picture window, so I basically have 3 sections. The deeper pocket in the center is convenient in 2 ways: the wider stool provides room for plants (and the cats when they were kittens) and the wider trim on top allows for a very nice pleated horizontal shade to fit completely inside the pocket. I haven't tried it yet (nor have I mentioned it to my wife!) but I'm not sure the shade will fit once I bring the interior face of the window further into the pocket. It's going to be close. When I pulled the interior stops to see what was going on, I found that the framing of the window is all set to accept the 3 1/4" replacement, so that should be a piece of cake. It'll just take a bit of ripping and then all three sections will be consistant and the world will once again be in balance. Everything should go smoothly for you once the stool is ripped down based on your description, although the mull (vertical bars) removals may leave exposed holes in the stool and head stop that would cause it to need patching-in or replacement. So, were the stops wider on the center unit as well since it was set farther? .... I can't remember the last time that I saw a unit set like that.. The verticals will not be removed. They are made of 2 by material and form the sides of the pockets into which the windows sit. I'm home now, so I'll make it easy for us. Existing picture window on left, VRW DH on right, dog's hind quarters in foreground. There's a VRW DH on the other side of the picture window also. I wonder if I can rip the stool in place. Plunge cut with a circular saw for most of it then my multifunction tool to get the ends next to the verticals. Thoughts? It would be a little tricky, but doable especially once the window is out. I'd only do it though if you are planning on putting a bead of caulk on the interior (to hide the imperfect cut), which being that the trim is painted I see no reason why not to. I'd almost go so far as to say that your odds of success are better that way than trying to rip the stool off in one piece to put it through a table saw.